Future animators awaiting the start of the first Counter Con. On Friday July 13th, during the week of the world famous San Diego Comic Con, an audience of kids, teens, and adults from throughout the greater San Diego area were treated to a panel of professionals from a variety of areas in the arts and entertainment field at a Tubman/Chavez Multicultural Center in the inner city of Southeast San Diego for the first time ever. 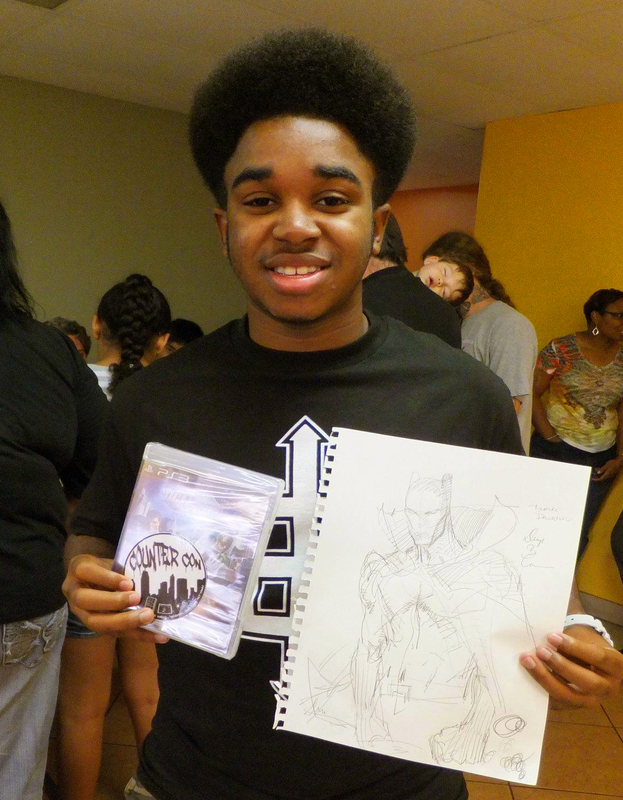 The goal was to expose a couple hundred underprivileged inner city kids to the possibility of a career in the field of comic books, animation, game art, or the behind the scenes business involved in these businesses, from people that are well known for doing that professionally, at a location in the inner city. Roland Poindexter fields a question. As the kids entered the venue, they were greeted with posters from some of their favorite shows on Disney XD, and Nickelodeon, provided courtesy of those two major animation studios, as well as our official Counter Con stickers, courtesy of Vince Alvendia and StickerJunkie.com. The Legend of Korra and Motorcity posters were in demand, but they loved the posters for all of the series, and we were honored to have them sponsored by the studios. 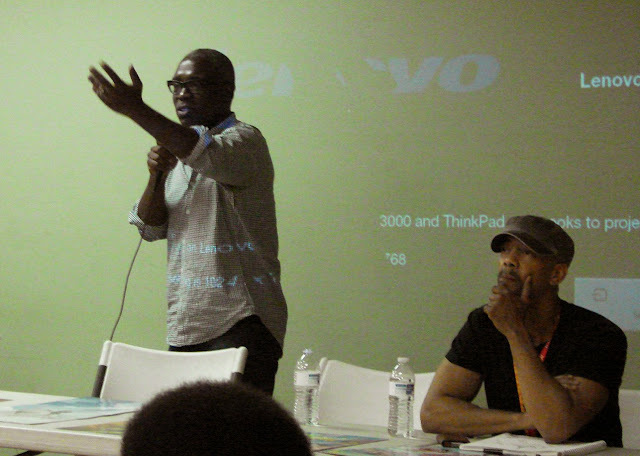 I introduced a highly accomplished and experienced group of panelist who were eager to share their stories of professional success, what they do, and how they got into their position as a pro artists, as well as encourage the kids to go forth and work towards their dreams, no matter where they came from. 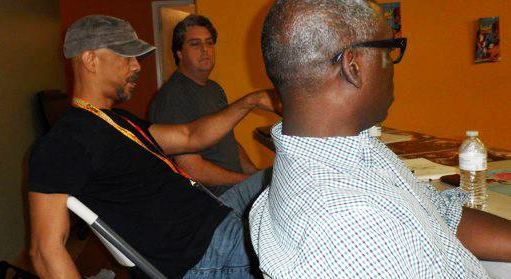 The speakers present were Denys Cowan, Lalo Alcaraz, David G. Brown, Roland Poindexter, and Brad Constantine. Special guest Superior Court Judge Dwayne Moring started off the speakers by telling an engaging and heartfelt story on how his childhood love for reading and collecting comic books led him to first be a journalist like Clark Kent, and now, a Superior Court Judge in San Diego, or, if I may, a real life crime fighting judge, either way, his motivation was inspired by what he read as a child in his comic book collection. As a childhood friend of the judge, I explained to the crowd how Judge Moring’s childhood passion for comic books inspired him to follow in his foot steps to not only collect comic books, but to also pursue a career as a comic artist if that was possible, and to seek more direction from the professional comic book artist gathered in town annually, at the San Diego Comic Con, starting in the mid-70’s. David G. Brown addresses the audience. 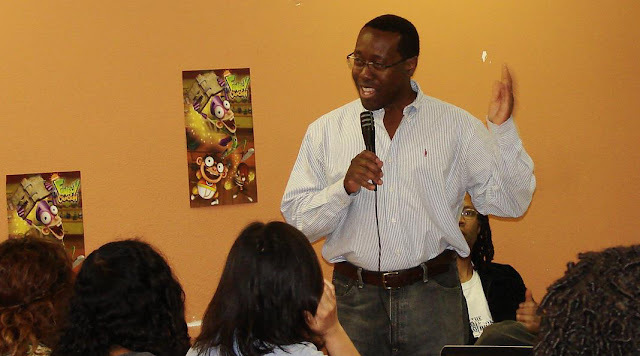 The next panelist was L.A.Watts Times/LA Sentinel award winning comic book artist David G. Brown, who spoke to the kids about his professional animation career and how that led him to discover his passion for working and teaching art to young people. He imparted to the kids that creating art is a way to embrace your uniqueness. David also publishes a series of comic books that teach kids how to resolve their conflicts without using violence, stay away from drugs, anti-bullying and other types of situations that kids may be confronted with growing up. He brought several copies to give away to the kids. 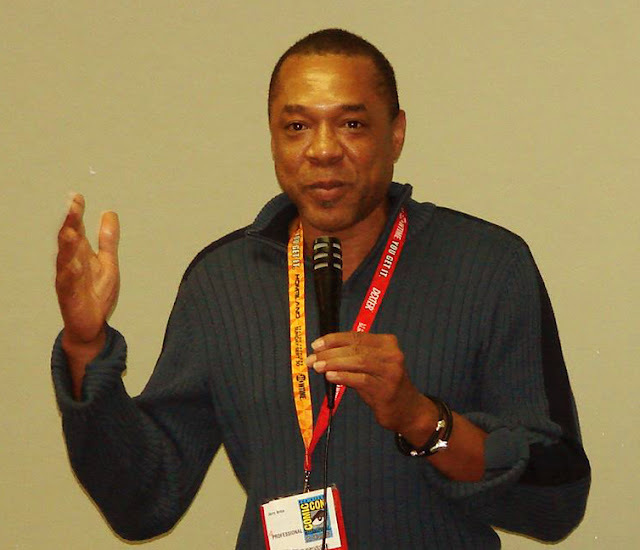 Next up was speaker Roland Poindexter who was just recently Sr. VP of Animation at Nickelodeon, and has worked at Fox, Warner Bros. among others producing and developing many hit series. He told the kids that sometimes, what you start off doing is not what you find yourself ending up doing…and that you never know when your opportunity will come along, you just have to be prepared to handle it. Know what you want to do, learn how to do it the best you can, and work hard at it, and you can do anything you want to do. Comic book artist Denys Cowan made jokes about his legendary status, but he went on to tell us that he started off his professional career as an assistant at the age of 14!! !...And he went on to get his first professional assignment as a lead at 17, was one of the founders of DC’s first black comic book company Milestone Media, creator and producer of Static Shock, producer of The Boondocks, to becoming a Senior Production Executive at the BET Network… which makes him a not only a well respected artistic talent in the business, but a leading business man in the entertainment industry. His participation in the Counter Con is significant. Giving back and supporting the enrichment of kids in the inner city is of utmost importance to Denys.He wanted the kids to know that when you start, some people will be out to discourage you, and when you start showing your work, some people will not like it, and some will, but the main thing is to never give up. Personally, I could relate to his experiences and career choices that confront an African American in the art and entertainment business. I really benefitted from what he had to say, and going forward, what he said will affect my own decisions, so that was great for all of us to hear. Brad Constantine sketches for the kids. Lead Sony On-Line Animator Brad Constantine, a native San Diegan and former private animation student of mine, gave a humorous and rousing accounting of his road from local San Diego kid to becoming a leading game animator for several years at major international corporate behemoth Sony games, located in San Diego. 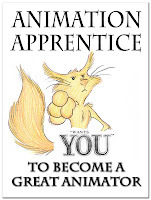 So Brad is still a local boy who made it in the animation world and can still enjoy living in America’s finest city. Brad’s message for the kids was to work on your skills, be persistent and passionate about what you are doing, and to be kind to the people you meet and work with. He also let the kids know that the internet has opened up new opportunities to access training, as well as to expose and gain an audience for your own independent work, no matter in what zip code you reside. 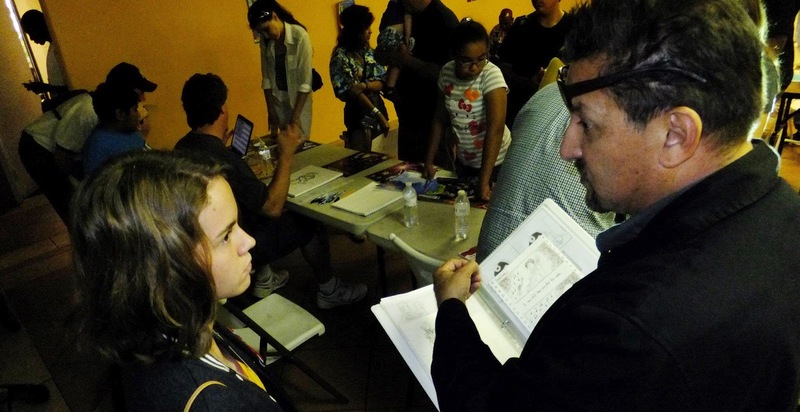 Lalo Alcaraz talks shop with the next generation. The final speaker was popular humorist and syndicated comic artist Lalo Alcaraz, creator of La Cucaracha first nationally syndicated, politically themed Latino daily comic strip from the LA Times Syndicate, who is also a native of Lemon Grove, which is basically San Diego. He got his start as a political cartoonist at San Diego State in The Daily Aztec, the student newspaper. His message was to work on your skills, don’t take criticism personally, and you will eventually get better. Draw everyday and keep drawing like your life depended on it. Lalo also announced that he has a television series in development that is Latino based, and takes place in San Diego, or a community inspired by San Diego, which is something for all local San Diegans to be proud of and to look forward to. Lalo was not only inspiring, but he was also very funny. The panel wrapped up by fielding a series of questions from the audience, and Tanya Diggs, a SR Account Executive at Burrell Advertising gave us all some very up lifting comments and observances to the kids, even giving them some insight about her position in advertising, and that we should not limit our dreams and goals in life, as well as our career choices. 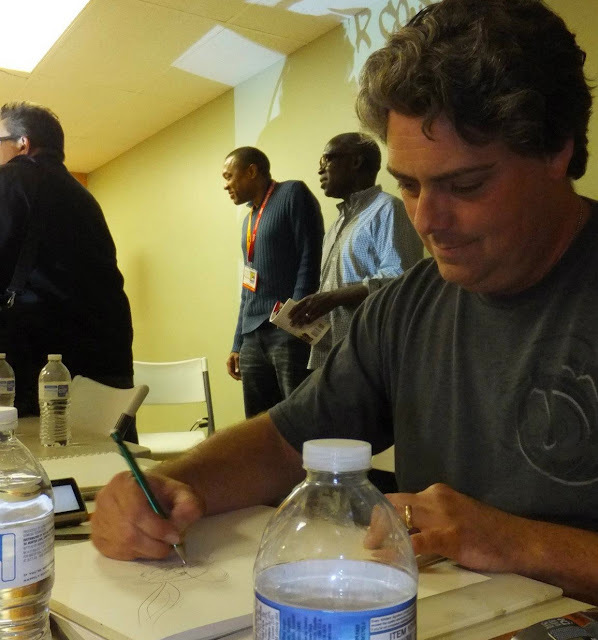 The event ended with an in-depth portfolio review, and Brad and some of the panelist did sketches of cartoon characters for the kids. Brad is gifted at drawing most cartoon characters past or present, from memory, and he put on quite a demonstration…the kids loved it! David G. Brown and Roland Poindexter review portfolios. Sony on-line entertainment provided a free version of their on-line subscription games for all the kids and teens in attendance, which was a big surprise for them, so the games coupled with the sketches and posters from Disney XD, Nickelodeon and the stickers from Stickerjunkie.com. Many got their first experience with swag, which is a big part of the Comic Con tradition. A young artist and his take-home swag. The children were inspired, and the community's interest was well served by this first of a kind event in the South East community. We are highly motivated to make next years event bigger and better, and we welcome all the support we can get to further the Counter Con’s effort, impact, and reach. Plans are under way to hold workshops and events throughout the year in-between the annual Counter Con, and reach the kids in San Diego at their public schools and local venues. Many pro artist and entertainment professionals who regularly attend the San Diego Comic Con were waiting for an opportunity like Counter Con to give to the people that may be underserved. 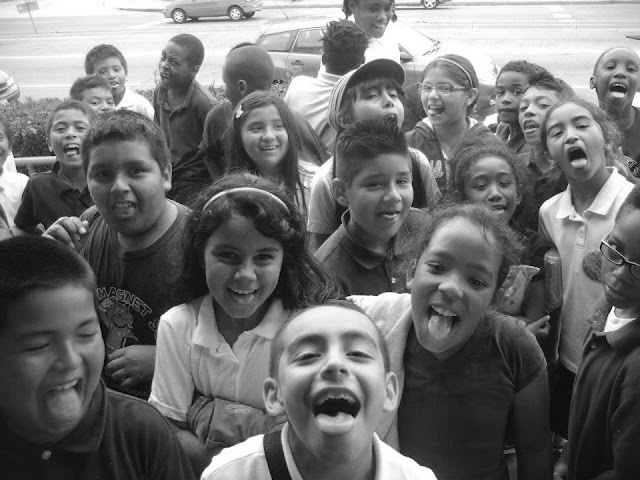 I am committed to providing them that platform on an annual basis to serve the needs of the children in our community, and foster the arts education in the areas of Game art, comic book art, animation and entertainment business. Counter Con host Jerry L. Brice. If you would like to help support or plan the Counter Con 2013, contact me, Jerry Brice, at: chacta@gmail.com. We will also be launching an Indegogo campaign to raise funds to help us further our goals and community initiatives born out of the Counter Con, so look for that! In closing I would like to thank Claudia Spinelli of Nickelodeon, Jay Francis of Disney XD, all my supporters on Facebook and FLIP, my production partners in my family, Derrick Ragsdale, and all of my former students from A.I. !...for helping to make the first Counter Con a really amazing, huge success for the kids and teens in the San Diego inner city! See you next year, and dream big!